Happy Friday, nerds and nerdettes! I twisted my wrist pretty badly yesterday, so I decided on a weekend post that would involve as little typing as possible; that could mean only one thing – another tasty edition of Sci-Ficandy! Today we have a selection of never-before-seen images from Star Trek: Voyager. The one you see above is an alternate angle from the episode “Relativity,” which featured a flashback to Voyager being constructed at the fabled Utopia Planitia shipyards over Mars. As we were finishing the episode, I moved the camera to the back of the ship just to see what it would look like and was really struck by how dynamic it was. We offered it to co-Producer Peter Lauritson for free if he could find a place for it in the show, but production was too far along to make room for an unscripted effects shot. Even thought it didn’t make it on the air, I loved the angle so I rendered a high-res image for posterity… and now here it is, all dusted off and shined up just for you! As always, these pictures are huge, so feel free to click, download and drool. Tom Paris was always a little twitchy with that trigger finger! Here’s the Voyager zipping along though the Slipstream, a trans-warp tunnel effect that looks not entirely unlike the background from an early Doctor Who title sequence. Cooincidence? I’ll never tell. Model maker Koji Kuramura went absolutely nuts busting up the Voyager for “The Year Of Hell,” a fun two-part episode in which Voyager and her crew go though a year of… um… hell. This scene was towards the end of Part II, the very first Trek episode that earned Foundation Imaging an Emmy nomination (we lost to famed Cellist Yo-Yo Ma. That’s right, Yo-Yo Ma). 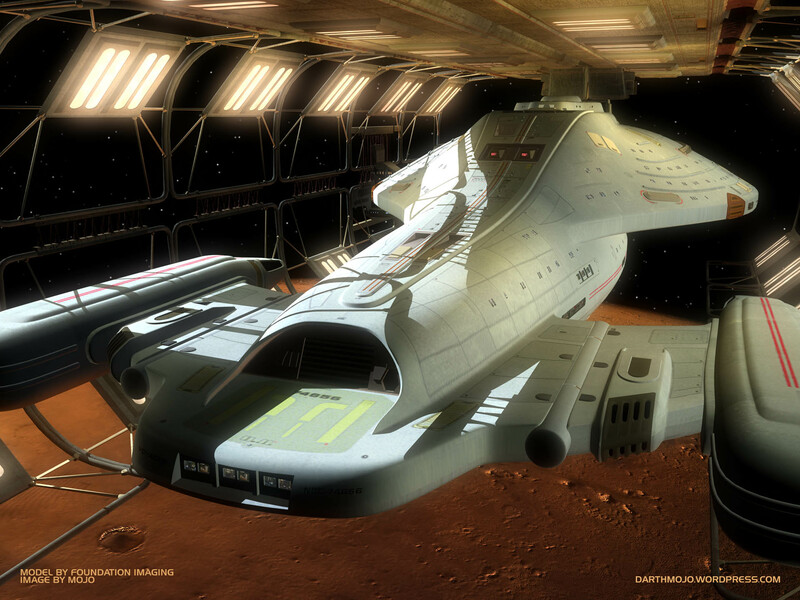 Here’s a great image of the Delta Flyer that Rob Bonchune and I had printed out and framed for our pal Doug Drexler’s birthday (hence you won’t recognize this from any episode). I can’t remember exactly what significance the Flyer had for Doug, but I’m sure when he reads this he’ll remind me! Voyager sails through “fluidic space” from the two-part episode “Scorpion.” The task of visualizing liquid space fell in my lap, so I started out with the “hyperspace” environment from Babylon Five and heavily reworked it. 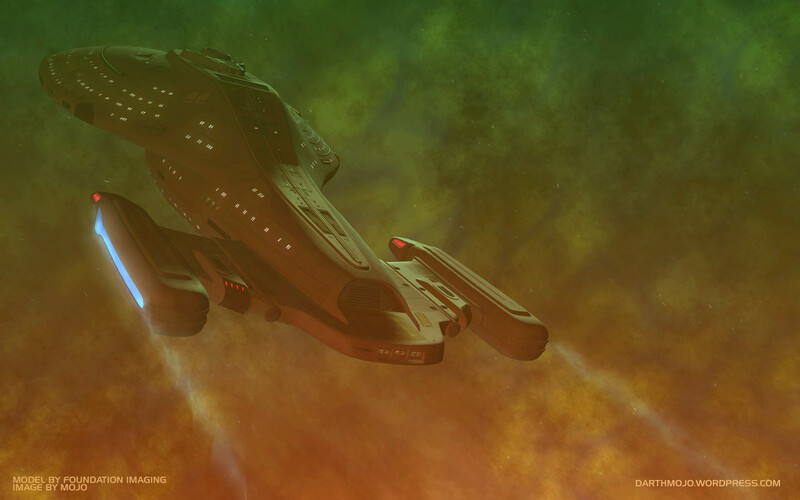 The finishing touch was coming up with a “trails” effect for the warp nacelles, an important element to visually suggest that the ship was traveling through something solid. I’ve always wondered about Peter Lauritson’s last name. It sounds a bit Estonian. Any idea if he has relatives in Estonia? Sweet scene creation once again, Mojo! I am so glad I discovered your blog. You seem to work (or have worked) on some of my all-time fave sci-fi shows and have even more of the same interests in sci-fi in general. Thanks for all of this great stuff you’ve posted and I eagerly await more. Take care of that wrist. Cheers! Thanks for sharing more eye-candy with us, mojo. I hope the wrist gets better soon as I’ve been making your blog a regular pit-stop in my day – your insights like that regarding TOS BSG were just spot on and something I think many of us who watched it on its first-run could relate to. Looking forward to reading more gems like those. Now that is what I call a variety of work on a tiny spoon shaped ship! It’s a pity that the work done on “Year of Hell” lead to nothing but a reset at the end. I would have liked to have seen Voyager a bit more scratched up as the series progressed. Beautiful stuff, as always. I may have had story problems with “Voyager” from time to time to time, but never at all any trouble with the look of it. Great work, all around. Did you ever work on DS9? I’d love to see a DS9-centric “SciFi Candy” in the future if you did. Say what you will, but I loved Voyager, both the ship and the show (the ship a bit more). I really love these shots, especially the Year of Hell edition! Thanks for the glimpse of what would have been possible with Voyager in HD. So wait, at what point in the series did Voyager switch from a Foundation Imaging model to an Eden FX one? Why the change? Always love a shot of the ships in drydock, thanks! Is the first pic just a bit blurry or are the textures not big enough for a HD render? Voyagers hull plating looks a bit odd. The picture is sharp but some of the textures on the Voyager don’t hold up to a render that big (remember this model was made for TV). Still, I wanted to include it here because it’s a great shot regardless. Oh mama! I could look at pics of Voyager all day long. Thank you so much for sharing. Now that BSG is on hiatus, I’m finishing up Season 7 of Voyager. What a pleasant and timely surprise! Oooh, old-style crappy steppy motion blur. In production were things like motion blur, volumetric lights, nebulas, all done in the render or done in postprocessing and compositing? The last episode of Voyager was pretty much the first time we did any sort of post-processing or compositing – nearly all of Babylon Five and Voyager were done “in camera,” meaning the shot we spit out had everything in it in one pass. Naturally, compositing gives you more control and allows you to make adjustments that help the final product, but there was something “guerilla” about spitting final shots out of Lighwave in one pass. You’d be surprised how much you can “fix” an in-camera shot simply by adjusting levels and curves on the completed image afterwards; for a space scene, this would require only ONE extra pass – the starfield (even a slight adjustment in levels can make or break the subtlety of the stars). I’d wager a TV series, always working under time and budget constraints, could get away with doing simple shots in-camera and save maybe 10 to 20 percent of the budget. I always thought they were still using miniatures for Voyager (except of course the Species 8472). How come the Voyager CGI model looks so much better than the NX-01 model? The NX-01 always looked fake and CGI-ish to me. Mojo, did Eden rebuild the Voyager model at some point? I know you pretty much shared the library, much of which was built for DS9’s “Sacrifice of Angels”, so I’m curious how many Voyager CG models were built and for what purposes. Despite being part of a mediocre Trek series, I’ve always been fond of the design of Voyager. 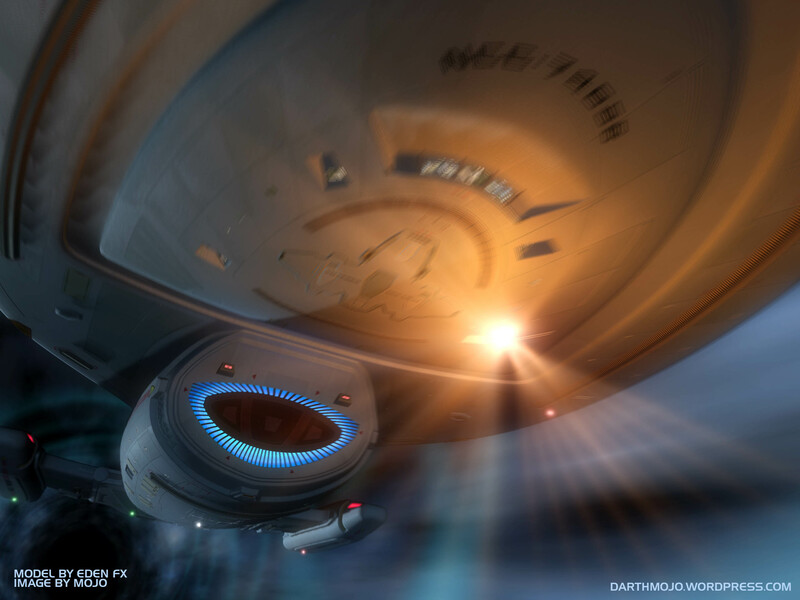 These pics are fantastic, especially the one with Voyager docked at Utopia Planetia. I love your blog. I am in awe of the work you do, and I wish I had your job! A few weeks back, you promised us some posts relating to the use of the classic Cylon Basestars in Razor. I *loved* the model for the classic Basestar. I think it is one of the few things about the original that outshines the current series. Any sense as to when we might get some posts on this? Do the setup files for all the effects shots still exist on a hard drive somewhere in case Paramount ever wants to remaster some episodes in HD? I assume the actors were shot on film. Hi Mojo! I have an Endgame question. There’s that scene at the end where we see the torpedo flying down a tube inside the Borg Sphere. I’m wondering – is the Voyager model actually *in* that shot? Even when playing around with contrast/brightness, I couldn’t make out the shape. (I was just curious to know whether it was wearing it’s armour at that point). Great shot of Voyager at Utopia Planitia, did you happen to work on the shots of the other ships and stations in that scene? If so, a sci-fi candy for me and many star trek fans would be to see more of the obscure ships, and not the hero-ship. Of the top of my head, isn’t that picture with the Delta Flyer from the Voyager season 6 episode “Good Shepherd”? Please correct me if I’m wrong. The Voyager model was created by Amblin Imaging, the first CGI facility to work on Star Trek (Amblin became Digital Muse and now Eden FX). Foundation adjusted details and texture maps during the course of the series, but the bulk of the model was still made by Amblin (the CG model was scanned from the 4-foot miniature). The captions in my renders will need to be updated. That’s what happens when I post too late! When Foundation closed down, the servers – along with the content – were auctioned off. Much of the content may have been saved by artists who worked on the series, but it would have to be tracked down. No matter how you slice it, it would be a considerable amount of work to re-integrate the entire Voyager visual effects server and re-render the FX in HD. In addition, although the series was shot on film, the entire post-production process was finished on NTSC video; to create an HD episode of Voyager, Paramount would have to go back to the vaults, re-transfer the film and re-built the episodes from scratch using the original editing data – if THOSE files still existed. It could be done, but will Voyager re-sell enough copies on HD to justify the cost? Are you saying that Foundation still had CG files from Star Trek on the servers that were auctioned off? I’m asking because JMS mentioned that B5’s CG files needed to be erased and transferred for storage to WB, where they were lost for whatever reason, though some of it did survive and was used as low-res reference in creating “The Lost Tales”. Does Paramount have a different policy? When a CGI company is hired to do FX for a production, in theory all the assets they create are property of the studio. A smart studio should probably ask for regular backups of data for a variety of reasons, most important of which would be safety backups and potentially the need to re-create the work elsewhere. However, this rarely happens, most probably because it’s just not anyone’s assigned job. Who asks for the data? Who checks it? Where do they store it? Who keeps the records? All this would need to be answered and a process implemented and in most cases, either no one has thought it through or wanted to spearhead a new headache. Even if all the ducks are in a row, often times the CG company, knowing full well the data they provide might be used to cut them out of the picture, will purposely not make it easy for the studio. Sure, they’ll provide the models as asked, but not the setup/assembly files (hey, setup files are technically NOT the model). All this means is that the more time passes, the less likely it will be to re-create CG scenes. If all the data and the directory structure on a company’s hard drive remains untouched, it’s fine, but the moment you start to back stuff up and clear it off the server, your chances of success begin to dwindle. Some companies have hired data management specialists to protect against this sort of thing (will Pixar encounter a “data chasm” when attempting to re-render all the scenes from the first two TOY STORY movies for their 3D releases?). However, since it means more money and something else to worry about, this is the exception rather than the rule. 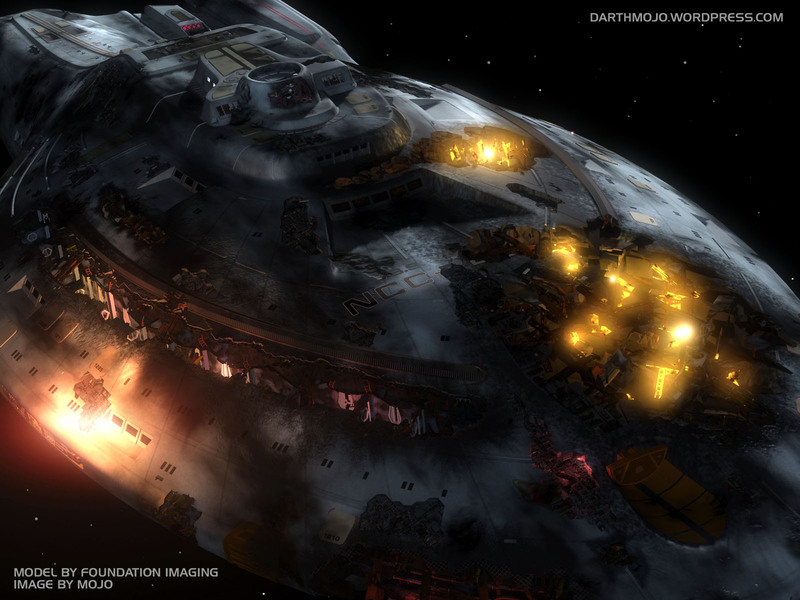 When Foundation tried to restore data from the first season of B5, we discovered that the backup software had automatically truncated all file names to 8.3 characters – so when Lightwave was looking for a texture map called “StarfuryWingLeft.PNG,” all it could find was a string of files called “Starfur*. ***” This would mean a user would have to load each image map into Photoshop, figure out what it was and were it was supposed to go and essentially rebuild the model from random data. In essence, everything from the first two seasons were lost. The data was still there, but reconstructing it would have been a nightmare. I don’t know what WB did to “lose” their own copy of the B5 files, but unless companies are more stringent about their data management in the future, I’m afraid there will always be a dozen reasons why the data can be “lost” forever. I really enjoy the Voyager series. Thanks for all of your hard work! Just have to say, these are GREAT shots, I use these as rotating backgrounds on my Macbook Pro and 23i LCD. If you have any more that you’re thinking of doing, please do post them! They’re awesome. I thought the original Voyager was modelled by John Gross ? I remember one of his interviews claiming how it took him 8 weeks to build the model. Mr. Mojo, sir, I’ve gotta say these images are seriously freaking me out! The Delta Flyer and planet image are amazingly beautiful on my desktop, and I’ll be printing that one!! That is just so wrong that the lovely rear view in the spacedock didn’t get it’s day in the proverbial sun! I’m *very* late here, and it looks like I have a lot to enjoy. Thanks for sharing your hard work here on the blog! Thanks for that image. ST Voyager was a great series. That’s really unfortunate that the CG files were lost. 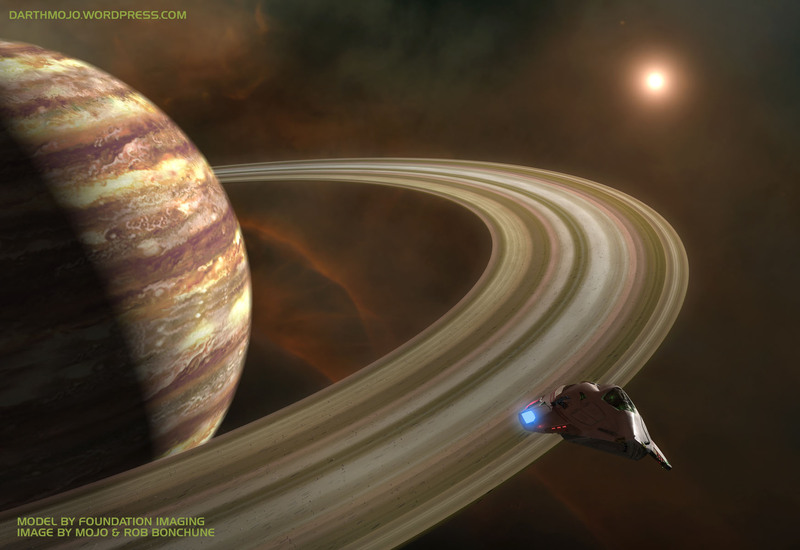 It would be amazing to see the Voyager craft in HD. If the initial wireframe was scanned from a 4 foot model, I suppose that could all be done again – but who’s gonna fund it. Not much point if it ain’t going in to production, I suppose. Isn’t there a question of copyright if you were to generate a complete image from CG files of a craft that was used in production? Is that considered fair use or copyright violation — the same would potentially go for any CG files that remained on hard drives, technicalities aside. In this day and age where programs are created and abruptly canceled (it’s in style, apparently), I’ve gone back to the old standards of which I consider Voyager one of. Thanks again for those images. Excellent work. how big was the colony? OMFG the best star wars chapter in 28 years!